The 2005 National Assessment of Educational Progress reports that less than one third of U.S. high school students read or write at grade level. Reading and Writing in the Academic Content Areas, a June 2006 Alliance for Excellence in Education brief, outlines the issues behind that appalling statistic. 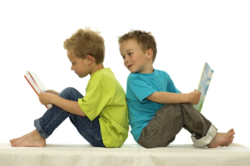 Reading advocacy groups have a renewed focus on adolescent literacy. What should local schools do? Students need access to materials on their current literacy levels to supplement instruction. Your media specialist or local public librarian can help. Those readers and writers who struggle most might need even more intervention and support to be successful. Get parents involved too. Teach them a few strategies to reinforce at home -- the same ones being reinforced across the curriculum. Focus on meta-cognition. Use think-aloud techniques to show students new thinking strategies you want them to acquire. Help students foster the ability to think; the core of strong reading. Make the problem-solving process that good readers use visible to struggling students. Build a team. And that doesnt apply just to high schools. Middle and elementary schools also can benefit from a focus on reading and writing in content areas. Facilitate open discussions between content area teachers, reading specialists, and administration. Focus on reading and writing as the means to raise overall achievement. Face the realities of your student body and encourage all teachers to integrate reading and writing strategies into their content instruction. Dont forget motivation. When students improve reading and writing skills and see a personal connection to learning, they develop new interest. Likewise, teachers who see students improve develop renewed zeal. Let a teacher try it once; theyll never look back," says Roland Smith, an author of books for children and young adults, who recommends that teachers use fiction in the content area classroom. He and many other authors have designed curriculum to make connections between content area learning and their books. You also can select micro-texts (excerpts) to enhance learning. William Bintz, professor of Curriculum and Instruction at the University of Kentucky states, Teaching reading [and writing] especially in middle and high school isnt just an addition to an already bloated curriculum; it allows teachers to create personally meaningful curriculum." No matter what your curriculum or grade level is, students gain more when they have the tools of reading and writing to help them understand it.